You may return most new items sold by fitnessequipmentestore.com or fitequipmentetc.com within 30 days of delivery for a full refund as long as the item(s) are unopened and in their original packaging. If these certain requirements are not met, a 25% restocking fee may apply. See Items that are Not Returnable below. Your return will be rejected if sent without an Return Merchandise Authorization number. To obtain an RMA number, please contact our Customer service department at 508 845-6774 or e-mail a service representative at support@fitequipmentetc.com. We are not responsible for lost return shipments. Return shipping costs are the responsibility of the customer. Please use a carrier that provides shipment tracking information with proof of delivery or request a UPS Electronic Return Label from us (see below).� Also, if an item was shipped free, you are responsible for the initial charges. 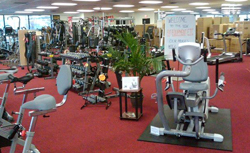 FitnessEquipmentEstore.com and Fit Equipment Etc. reserves the right to inspect all returned products and may reduce the credit if the product is returned damaged or incomplete. If shipment is refused or undeliverable, a 25% restocking fee will apply. If you receive a defective or damaged item, please contact customer service within 48 hours of receipt of goods. At our discretion, we will either (a) provide free return shipping for the defective or damaged item and ship a replacement item or (b) ship replacement parts necessary to restore the item to its advertised condition. If you do not agree with our decision or would like a refund, you may return your item under the terms of our 30 Day Satisfaction Guarantee (above). If your item arrives via common carrier truck, please be sure to note any damage or shortage on the delivery receipt before signing for a shipment. Title of goods passes to the purchaser when a shipment is accepted for transportation by the carrier. When you sign for a shipment, you are indicating that all cartons shown on the receipt are present and in good condition. If this is not true, be sure to note the discrepancy and have the driver initial it. For items shipped already assembled, open all cartons immediately while the driver is present. Do not discard the cartons until you know the contents are in good condition. Please contact us immediately if the item is an assembled piece or if the damage involves a part that can't be replaced. Failure to follow these steps will void this return policy. If the merchandise you receive does not match what you ordered, you must notify us within 7 days via phone or by emailing support@fitequipmentetc.com. Failure to do so may void this return policy. Please note that many orders will arrive in multiple shipments from different warehouses. Partial refunds will be issued for any item that is not in its original condition, is damaged, or is missing parts for reasons not due to our error. Up to 50% of the item's price may be subtracted from your refund amount. If your order was shipped by UPS, USPS, or FedEx, you may request a UPS Electronic Return label. You will receive an email from UPS containing the instructions you need to obtain and print your label. Affix it to your repackaged item and take it to a UPS Store location or hand it to any UPS driver. Return mailing labels are valid only for returns shipped within the U.S. Unless customer service has authorized return shipment at our expense, the cost of return shipment will be deducted from your refund. The amount deducted will be equivalent to our standard shipping cost for that item. This includes items shipped under our Shipping Included promotion.